Berzerker_prime's Adventures at The Two Towers Movie Premier! 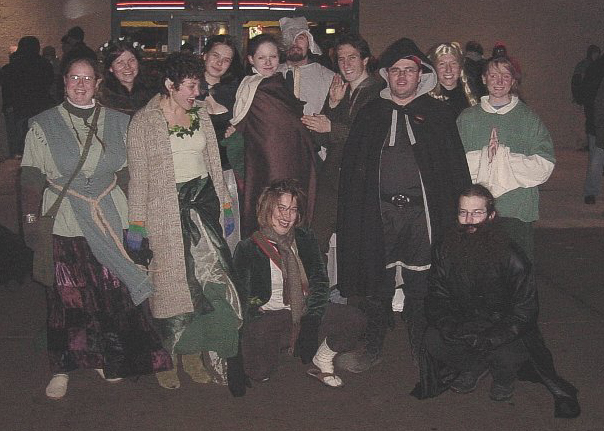 When the time came for the second movie in Peter Jackson's trillogy to open all across the US, the Ring Gaming group was there. And of course, I was there with them. A very large number of us went to the very first showing at midnight at Point Cinema on the West side of Madison. It was cold and rainy, but we all stuck it out from about 9 PM until movie time. This marked the third time my Elf costume had made an appearance. I still had the green beads in my hair (they're not very visible in any picture I have, sadly) at the ends of my braids and for the first time the rest of my hair was loose. 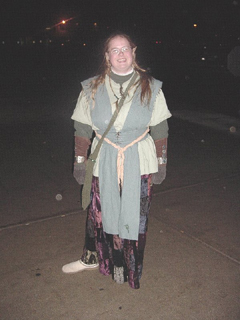 Other changes to the costume included adding the braided belt (tied with a square knot), the use of a skirt rather than the brown jeans, some stitch work along the sleeves of the green t-shirt, gloves, and different shoes. Still present are the ears (natually) and the metal gauntlet bracelets. Discarded was the green cloak. Fast facts: This incarnation of the costume I named "Lindirawyn." Previous names were Alccristiel at The Second Age Game and Lindir at Ring Game. To the best of my knowledge, Jack Barker had the honor of having come the longest way to see the movie with us, having come from the twin cities. Scott Johnson brought along his laptop and a copy of Fellowship to watch while we were in line and when it started raining, Sarah Lang made use of her umbrella to protect it. We skipped to the nice, warm Balrog scene. This page created on 6/8/03 by Berzerker_prime.